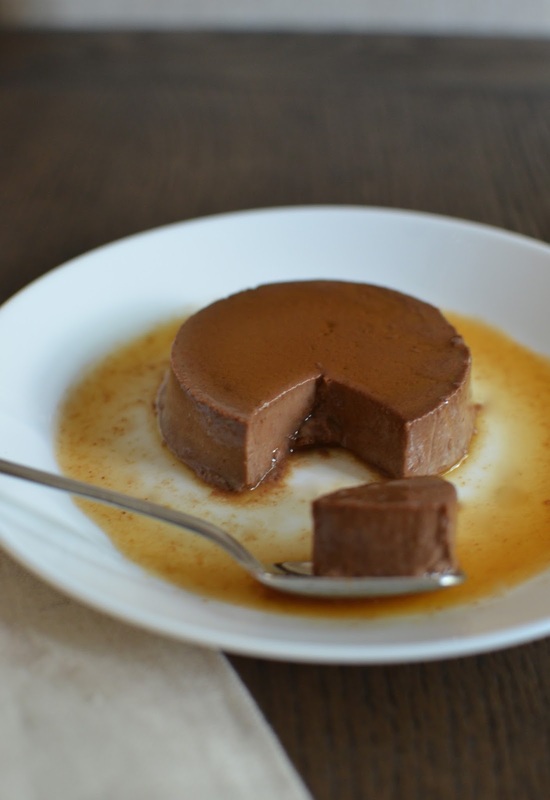 There are just four ingredients in this chocolate crème caramel. You start with melting some sugar for the caramel. This recipe uses the dry method of simply heating up a few tablespoons of sugar (without water). Stir as it melts and turn off the heat/stop cooking once it reaches a golden amber color. It happens very quickly. And speaking of the custard, it's eggs on the one side and a mixture of dark chocolate melted into some hot milk on the other. Do note that if you use bittersweet chocolate (as opposed to milk or semi-sweet), it is particularly hard to melt. It doesn't need to melt completely into the milk but if don't want to see too many specks of chocolate in your crème caramel and want it as smooth as possible, you can place the chocolate and milk mixture over a low heat and stir it a bit longer to melt as much of the chocolate as possible, which is what I did. Distribute the custard among your ramekins. Notice there's quite a bit of bubbles on top. That becomes the bottom so it's not a big concern. You can strain the mixture through a fine mesh sieve to eliminate some of the bubbles, if you like. The custards bake in a water bath at 300 degrees for about half an hour or so, until they are essentially set but still jiggle just a bit in the center when gently moved. Remove them from the oven and the water bath, let cool, then refrigerate at least 4 hours or overnight. It's a good idea to make them the day before you plan to serve them for dessert. And what a great little dessert it is! Preheat the oven to 300 degrees, with a rack in the middle position. Line a roasting pan or 9x13-inch baking pan with a double thickness of paper towels (this is to prevent the ramekins from sliding/moving). Set four 6- to 8-ounce ramekins nearby. Bring a kettle of water to a boil. Reserve 2 tablespoons of the sugar and sprinkle the remaining over the bottom of a small skillet or saucepan. Heat over medium-high heat. When sugar begins to melt around the edges, stir in small circles with a wooden spoon, making your way around the edges then towards the center of the pan, until all the sugar is melted and bubbling, and a medium amber color develops. Keep a close eye on it because the color changes rapidly. Remove the pan from the heat and very carefully (the caramel is extremely hot! ), divide the caramel among the 4 ramekins. Hold the ramekins by their tops and swirl to the coat the bottoms as evenly as possible. The caramel sets very quickly and you will not be able to evenly spread the caramel but that is perfectly fine. Place ramekins in the roasting pan. Place chocolate into a heatproof bowl. Put milk and the reserved 2 tablespoons sugar into a small saucepan, and bring it to a boil. Pour the hot milk over the chocolate and let stand for 5 minutes to allow the chocolate to melt. Meanwhile, put eggs in a medium bowl and whisk them for about 1 minute. Using a rubber spatula, stir the chocolate and milk together until smooth (Note: the chocolate may not be completely melted, especially if you use bittersweet chocolate; if you are concerned with too many specks of unmelted chocolate, you can place the mixture into the pan you used to heat the milk and heat it under a low-heat, stirring, to melt further; let cool slightly before proceeding to next step). While stirring the eggs constantly, slowly pour the hot chocolate milk mixture over the eggs and stir until blended. You'll have bubbles on top of the custard but it's not a major concern since that will become the bottom (Note: you can strain the mixture over a fine mesh sieve to eliminate some of the bubbles). Divide custard among the 4 ramekins. Pour enough hot water into the roasting pan to come halfway up the sides of the ramekins. Carefully (you don't want any hot water getting into the ramekins) place the pan into the oven. Bake until the custards are firm around the edges and just jiggly in the center, about 30-45 minutes. Carefully remove the roasting pan from the oven and place ramekins on a cooling rack and allow to cool for about 20 minutes at room temperature. Transfer them to the refrigerator and chill for at least 4 hours, or until thoroughly cold before serving (it's a good idea to make these ahead the day before, covering and keeping in the refrigerator until serving time). To serve, run a small knife around the edges of the ramekin to loosen, then turn it over onto a small plate with rimmed/raised sides. You might need to shake or tap the ramekin a bit to get it to release but the custards will surely pop out. Now that's a perfect caramel chocolate dessert, Monica. It's so tasty...great dinner party type dessert. I have never gotten to try a chocolate version before! I am loving the sound of that! I've never been a huge flan person but with the chocolate ... well, now that I can most certainly get behind!! Happy Tuesday Monica!! When it comes to dessert - everything I eat that isn't chocolate, I want to seek out the chocolate version to try! : ) This blows the regular out of the park. It's not too sweet and just the perfect bites after dinner. Everything's been going off (trying to clam too much in too little time - I'm sure you can relate!) so I'm relieved this turned out right! It was very tasty and I'll be making it again for sure. Now that's enticing, i can't wait to try it out in my kitchen. Glad you like it! Thanks so much. This sounds spectacular! What a great dessert. I want to prep it next time I have guests over for dinner. Great make-ahead, seems "fancy" but is actually quite easy. What a beautiful dessert, so elegant. Sounds exactly like something I would love. I've come over to your side a lot in recent years as far as enjoying fruit desserts but my heart belongs to chocolate. I think your chocolate-loving husband might enjoy this. : ) Hope all is well! This looks incredible Monica! Smooth chocolate custard sounds like something I could eat everyday. This creme caramel is the perfect way to end a meal! Yours look so smooth, silky and delicious! Thanks, Jasline...a little different and another excuse to eat chocolate! Absolutely try this out one day, Wendy. It might be the chocolate lover in me speaking but my hubby (who sure loves chocolate but isn't as insane as I am...) also thinks the chocolate version beats the regular. Mouth watering ! Looks so perfect and delicious. Love the addition of chocolate. Thank you for lovely share. Bookmarked! Thank you so much...it is really good stuff! This is such a popular dessert in Brazil. I ate it so much growing up. It is one of my favourite desserts. YES! YES! YES! I will take this chocolate flan any day over a regular one. :) You did such a beautiful job. I can't wait to dig in this creamy and chocolatey flan. Have a good weekend! Chocolate makes everything better, says a very biased opinion (mine)! : ) You enjoy the weekend as well - thank you. Creme caramel is one of my favorite desserts but I have never even thought about making it with chocolate. It sounds sooo good, I have to give it a try!